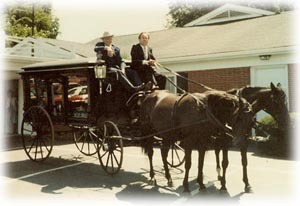 Muir Brothers Funeral Home has been serving Lapeer County for over 100 years. Four generations of the Muir family have been dedicated to serving the Lapeer Community. We are proud to be the oldest Lapeer County funeral home, under original family ownership. This tradition of community service began in 1908 in Dryden, Michigan - with Allen Muir, William Muir and Walter Muir, the original “Muir Brothers,” the funeral home started in their home. As was the custom of the time, many visitations took place right in the home of the person that died, with a funeral possibly at a church. Later, the brothers later moved to downtown Dryden, then to Almont. As the family grew, the second generation moved into neighboring towns. Paul Muir opened the funeral home in Lapeer, Grant Muir opened Imlay City and Norman & Richard Muir operated the family’s funeral home in Almont. To this day, all Muir Brothers Funeral Homes are independently owned and operated by some extension of the Muir family, but each remains focused on their own community. Paul Muir opened Muir Brothers Funeral Home, Lapeer in 1952 he and his son Larry Muir, built the reputation to where it is today. Larry Muir, along with his wife Sharon, have continued the tradition of serving families of Lapeer. "Our longstanding commitment to serving our customers and the community sets us apart," said Larry. Building relationships and earning trust from our community have been at the forefront of the Muir family philosophy. In the early 1990's, Larry and Sharon Muir's children joined the family business. Together with their children, the fourth generation Muirs; Colleen Muir, Todd Muir & Nathan Muir as well as other family and close friends, Larry and Sharon continually raise the standards at the funeral home. We believe in educating the families in every way we can, simultaneously raising their expectations of us. “As lifetime Lapeer natives, we feel a responsibility to our neighbors for the highest level of service with reasonable pricing,” says Sharon. Have the skills to present the deceased in the most natural appearance for a more comforting goodbye. Offer personalized and affordable services and products. Participation and donations in our community; from civic organizations, churches, schools, recreation & teams to local hospice organizations and more. Above all else: assist families honoring their loved ones in the manner best suited for their family & friends. We believe that the success of any business requires dedication and professionalism. In our business, in particular, it also requires a great deal of kindness, compassion, trust and attention to detail. We strive to provide this level of service from all of the Muir staff, to each and every family we serve. We are where we are today - because of where we've been, we're always here for you. Put your trust in us to make this experience as comfortable as possible. Our family serving your family for four generations.